So you have the Google Ad Grant for your 501(c)(3), your ads are being displayed on Google, awareness is being spread about your mission, more people are visiting your website and becoming involved with your group. The new-found exposure is great… but did you know that exposure can actually be quadrupled? Yes, quadrupled! Google offers a more robust program called Google GrantsPro. This advertising grant is available to 501(c)(3)s who are already using the the Google Ad Grant. 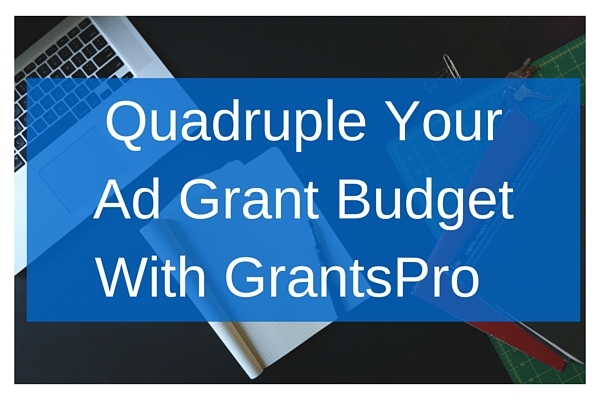 With GrantsPro, the monthly budget increases from $10,000 to $40,000. Imagine what your non-profit could do with an additional $30,000 a month in ad spend! With an extended budget, you can create more advertising campaigns. Get more newsletter sign-ups, and more. $40,000 worth of advertising on Google is a momentous benefit. Your non-profit may already be eligible for this program. Conversion tracking must be installed on at least one of your campaigns. Had at least one conversion in the last 30 days. Met your advertising budget for at least 2 out of the past 6 months. The Click-Through-Rate (CTR) must be at a minimum of 1% over the past 6 months. You must agree to participate in an annual survey and share your conversion data. Are you currently meeting these requirements? Do you know how to tell if you are? No worries, make it easy on yourself by getting a free evaluation. Our partner, idGrants specializes in GrantsPro. They can evaluate your current Adwords account and tell you if you qualify. Don’t have an AdWords account? They can check your eligibility for the Ad Grant too. Think of all the possibilities your non-profit could achieve through this increased budget! In fact, the possibilities are endless. So, what are your goals? Do you want to encourage social media followers? Increase event attendance? Gain more donors? Promote your online store? Contact idGrants for a free evaluation and get started with GrantsPro today. Updentity is a financial supporter of the Better Communication Forum.